In our last article, we discussed some different options available to solar borrowers. These are considerations which new solar homeowners need to take into account when evaluating solar financing offerings. Today we will consider the topic of loan maturity. Should you get a short-term or a long-term solar loan? There a few points to take into account when making this decision. First of all, let’s talk about the loan maturities which are typically available in the market. On the short end, you will find 5 year loans, not unlike many car loans. At the long end, there are several 20 year maturities and even a few 25 year solar loans, looking more akin to a home mortgage. There are numerous offerings in between these extremes. So, how to decide amongst all these options? For starters, it should be understood that short-term loans have lower interest rates than long-term loans. A typical 5 year loan may have an effective APR in the 6% range, while a 20 year loan will have rates closer to 8%. It doesn’t seem like a huge difference, but over the course of the respective loans’ lifetimes you might end up paying $12,000 more interest on the 20 year loan on a typical system. While the 8-year loan featured above has a fairly low lifetime interest cost, the monthly payment will probably not allow for immediate savings on the solar system. That is, the solar system’s monthly payment may actually be higher than the electricity cost which it eliminates. Most people find this to be very unattractive, and opt for a loan with a lower payment. But for a borrower taking a long-term view, the shorter term loan may actually be the best option; because at the end of 8 years he or she will be paying zero for solar, with 100% of the electric savings staying in his pocket. Since solar systems generally have an expected life of 25 years (or longer), that’s at least 17 years of free energy being generated by the panels. However, if your goal is to maximize cash savings from the moment your system is turned on, then the 20 year loan makes more sense. Many installers have a lender and loan product they are most comfortable using, and tend to promote this without consideration of the homeowner’s needs. Homeowners tend to be too preoccupied with the specifics of the solar equipment they are purchasing to ask questions about the loan they are being offered, particularly the loan maturity. 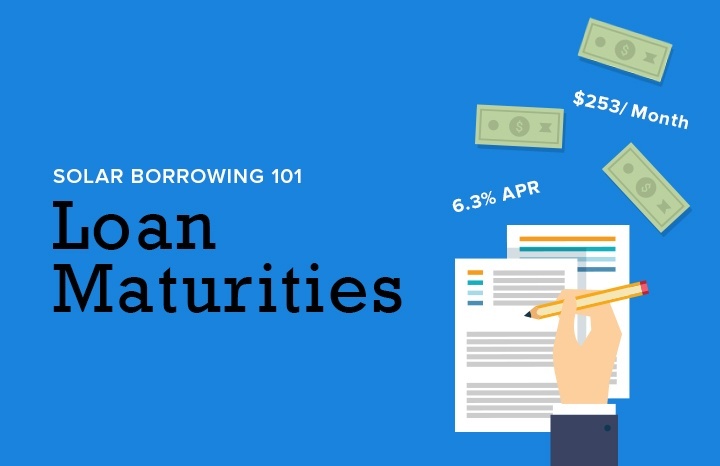 Make sure you look at the loan and maturity options available. If your installer does not give you an array of options, do some research and find an alternative which better suits your needs and preferences. Gordon is an Operations Manager at Pick My Solar. Gordon graduated from Claremont McKenna College with a B.A. in Environment, Economics, and Politics. In addition to solar, Gordon has interests in water conservation, land management, and environmental policy.